Fewer seismic events and lessened ground deformation indicate that the ongoing eruption of Mayon Volcano, the Philippines' most active volcano, is finally slowing down, according to a Sept. 9 bulletin from the Philippine Institute of Volcanology and Seismology (PHIVOLCS). The slowdown follows almost two months of volcanic unrest for the mountain, which is located on the Philippine island of Luzon. 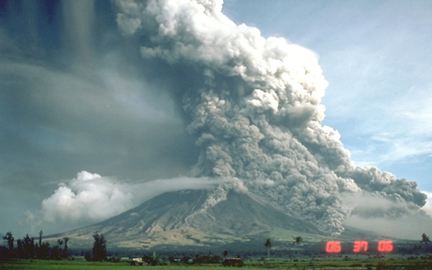 During a 1984 eruption, pyroclastic flows cascaded down the flanks of Mayon Volcano. That eruption and the more recent activity, now slowing, mark only a few of the mountain's long history of eruptive events. Images are courtesy of the U.S. Geological Survey. On July 14, Mayon started a "mild" eruption, as pieces of lava tumbled midway down the mountain's flanks, and the number of earthquakes and amount of sulfur dioxide emissions increased, according to PHIVOLCS. As a result, the institute increased the alert level to 3 (out of a possible maximum 5) implying an "increased tendency towards eruption," and advised that people stay at least 6 kilometers away from the mountain. Then, on Aug. 7, the institute raised the alert level to 4, indicating an eminent eruption, as six small events between 7:08 a.m. and 7:48 a.m. spewed ash up to only 800 meters above Mayon's summit. The large explosive eruption that some scientists expected never happened, however, and the number of volcanic earthquakes has been dropping. Scientists detected 31 events on Sept. 2, followed by nine events on Sept. 3 and only two on Saturday, according to PHIVOLCS bulletins on those days. Still, despite the slowdown, Mayon remains under an alert level 4, and areas 8 kilometers from the mountain are considered a hazardous danger zone. Mayon Volcano is located on the Philippine island of Luzon, at the junction of two tectonic plates. Mayon is the most active of the region's major volcanoes. Beyond the hazardous zone, about 30,000 people remain in evacuation centers, where they have been living for more than a month, according to a Sept. 8 Agence France-Presse report. So far, there is no word as to when evacuees can return home, the report says. Such unrest is nothing new for Mayon, which rises 2,462 meters above sea level at the boundary of the converging Philippine and Eurasian plates. Records dating back to 1616 indicate that eruptive events, producing pyroclastic flows and mudflows, have been a regular occurrence for Mayon, according to the Smithsonian Institution's Global Volcanism Program. The last major eruption to warrant an alert level 5 took place on July 26, 2001, when an explosive plume reached 10 kilometers above the summit, and pyroclastic flows headed toward surrounding cities. The most deadly eruption struck in 1814, when lava from Mayon buried the town of Cagsawa, killing 1,200 people, according to the Global Volcanism Program.